Although there have been huge advances in cross-sectional imaging technology in recent years, radiography continues to make up more than half of the imaging studies performed in St Vincent’s University Hospital and this is unlikely to change any time soon. The reason for this is the huge advantages that radiography offers over other imaging techniques in terms of cost, time and accessibility, as well as the fact that it is perfectly suitable for diagnosing many abnormalities, such as fractures. It remains the best first-line imaging test for chest disorders and for most musculoskeletal complaints, as well as being useful in the investigation and follow-up of many abdominal conditions. Our radiography rooms use digital radiography, which has replaced the traditional film-based practice. 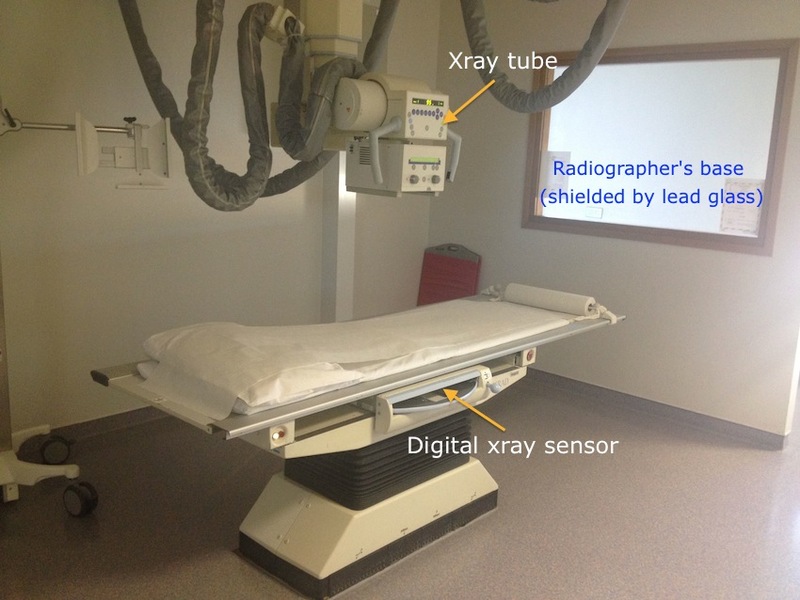 Instead of the xrays passing through the patient and exposing a single-use film plate, they hit a digital sensor which instantly sends an image to the radiographer’s workstation for review. Previously, the film plate needed to be developed in a darkroom (the darkroom in our department only closed in 2006). One of our standard digital radiography rooms. There are nine digital radiography rooms in the department; six rooms in the main department on the second floor, where inpatient and GP referrals are imaged, and three rooms on the ground floor beside the ED, where ED and outpatient referrals are performed. Digital sensor for PA chest radiographs. 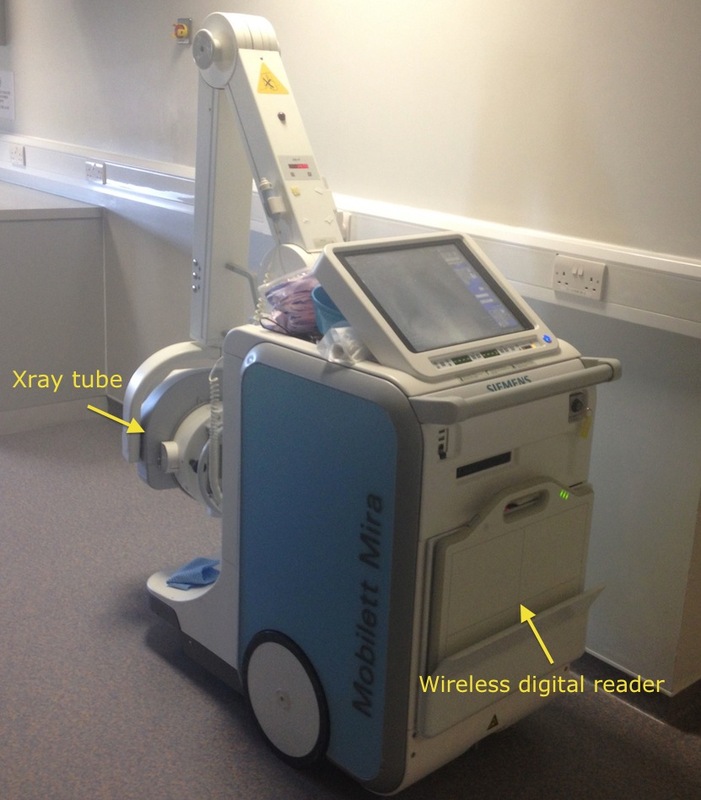 For portable radiographs (usually chest radiographs), a wireless digital reader is used. This is placed behind the patient, generally as they sit up in bed. 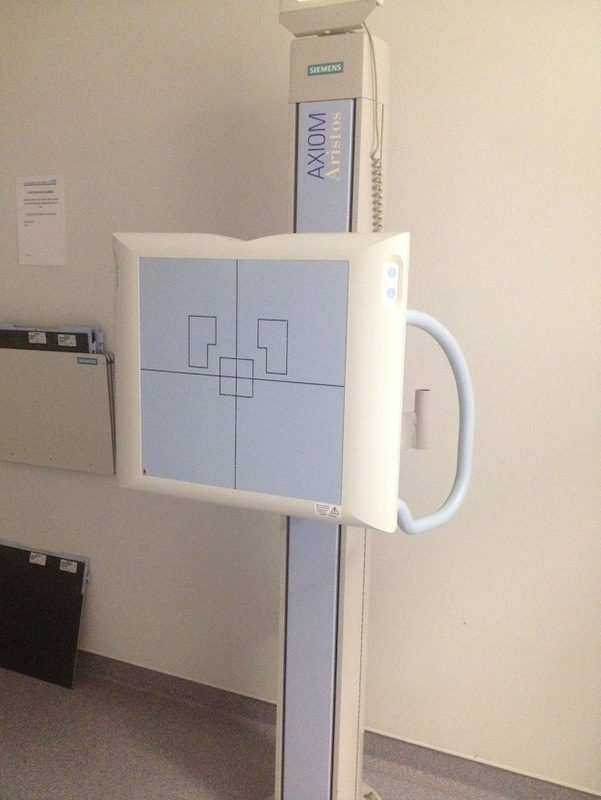 An exposure is performed, and the image is beamed wirelessly to the portable xray machine. This can then be downloaded to the PACS system when the radiographer has finished carrying out their round of portables (most ICU patients have a portable CXR every day, so these are carried out in batches by the radiographer each morning). Our portable radiography unit is shown on the right. Assuming that the radiographer is happy with the image quality (and they usually are – one of the huge advantages of digital radiography is that it is much more forgiving of under- or over-exposure than film-based radiography was), the image is sent to PACS for reporting by a Radiologist. Very few radiography studies now need to be repeated for incorrect exposures (prior to the advent of digital radiography, up to 10% of radiographs needed to be repeated, resulting in additional radiation exposure, time and expense). Other advantages of digital radiography are that xrays no longer go missing (a huge problem in our old film-based department), and the significant cost saving now that we no longer need to order expensive xray film.